An image captured by the Cassini spacecraft shows the streaks of material that make up the planet's rings. The streaky details of Saturn's rings have been captured in amazing detail in new images from NASA's Cassini spacecraft. In many portraits of Saturn, the planet's rings appear to be a solid disk of material. In reality, the rings are made up of chunks of rock and ice, varying in size from grains of dust to small mountains. In the latest amazing image from Cassini, these granular ribbons of material can be seen circling the planet, like grooves in a vinyl record. Cassini captured this latest view of Saturn from a distance of 1.4 million miles (2.3 million kilometers) on Aug. 12. However, NASA released the image on Dec. 8. There are multiple sections to Saturn's rings, which are named with letters A through G. The shadow of the A and C rings can be seen projected onto the body of Saturn in the lower right corner. This image from the Cassini space probe shows Saturn's rings edge-on. Many details of the rings can be seen in the shadow they cast on the body of the planet. In a second photo from the Cassini spacecraft, released last month, the shadow of the rings takes center stage. The variation in light passing through the rings highlights that the rings are not entirely opaque. (The moon Tethys can be seen in the bottom right corner below the ring plane. Mimas can be seen just above the ring plane at about 4 o'clock). The image was taken 1.1 million miles (1.7 million km) from Saturn. For much of history, astronomers were puzzled as to how the rings could steadily orbit Saturn without breaking apart or drifting away from the planet. In 1857, physicist James Clerk Maxwell demonstrated that the rings of Saturn must be made up of smaller chunks of material that orbit together. In the 1970's, astronomers showed that the rings are mostly made up of water ice, and in the 1980's, the Voyager probes provided the first up-close images of the rings' structure. Scientists believe Saturn's rings (and its moons) are at least 4 billion years old, and thus contain remnants of the early solar system. The relative density of material in the ring plane makes the rings appear solid from far away. 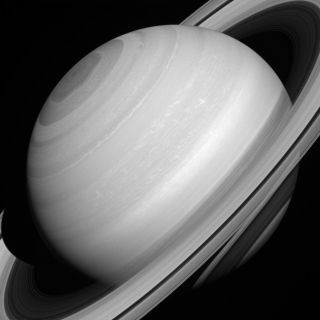 Saturn's rings extend 170,000 miles wide (273,600 km), but only 30 (10 meters) thick. A close-up of the gas giant Saturn and the pint-sized moon Enceladus (lower left corner). Saturn's enormous size is captured in a portrait of the gas giant with one of its small moons, Enceladus, which is only 313 miles (504 km) wide. The miniature moon stirred up excitement among astronomers when Cassini identified vapor jets coming from its south pole. The jets could indicate a water reservoir under the surface of the small satellite. This photo, released by NASA on Dec. 1, also includes a prominent storm on Saturn that is visible at the center right of the image. NASA's Cassini spacecraft launched in 1997 and has been orbiting Saturn since 2004. The spacecraft is currently in an extended mission phase that runs through 2017.